Everest Base Camp Dispatch: September 28, 2015 – Monday Morning, 7:00 AM We are in Lukla! September 28, 2015 – Monday Morning, 7:00 AM We are in Lukla! Great luck this morning. Scot, Keely, Alyssa and Temba landed in Lukla at 7:00am. Time to go trekking! Good luck team, we look forward to seeing more photos and hearing stories soon. 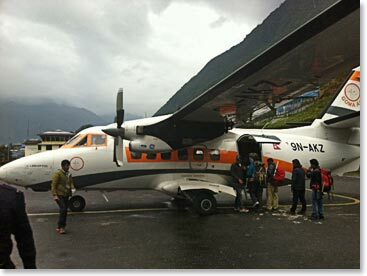 "First Flight" We landed in Lukla very early on Monday morning. Amazing start to our trip. Scot Alyssa and Keely have been in Nepal less that 24 hours and they in Lukla!